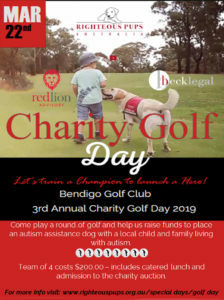 The Righteous Pups Charity Golf Day and action will be held at the Bendigo Golf course on Friday, 22nd of March 2019. This year we are playing to raise $29,000 to assist the Graham family from Kangaroo Flat so their daughter can receive an autism assistance dog. Their daughter has been diagnosed with Autism, Pathological Demand Avoidance and severe Separation Anxiety. They really need our help! A team of 4 costs $200.00 which also includes a catered lunch and free admission to the charity auction.